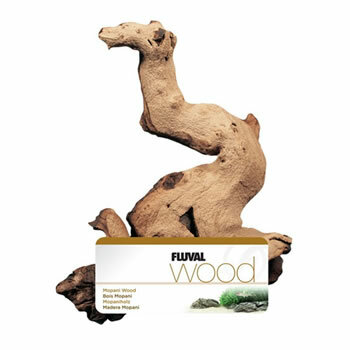 Fluval Mopani Driftwood is a naturally crafted aquarium ornament which will provide a unique and realistic element to your aquarium. Mopani Driftwood will also add a slight tint to the water, creating more natural-looking water conditions. The wood is thoroughly cleaned to eliminate all extraneous material, ensuring safe use in aquariums and terrariums. Please note that each piece is unique in shape, size, and colour and due to the irregular shape of the driftwood the sizes are approximate. 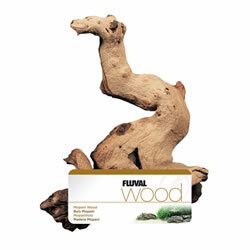 Soak the Mopani Driftwood prior to use in an aquarium. Sometimes the wood can cause a very mucky brown discolouration to the aquarium water, this is not harmful but can look unsightly. By pre soaking the wood before adding to the aquarium this can be prevented. Just keep changing the water until it remains clear.